If you have any question, contact us clicking here. To Learn More About Systema Click Here. MAXIM FRANZ is currently one of the most experienced Systema instructors at Vladimir Vasiliev's school in Toronto (Systema HQ) where he usually teaches the Friday night class, as well as most of Vladimir's classes when he is away conducting seminars or at other events. 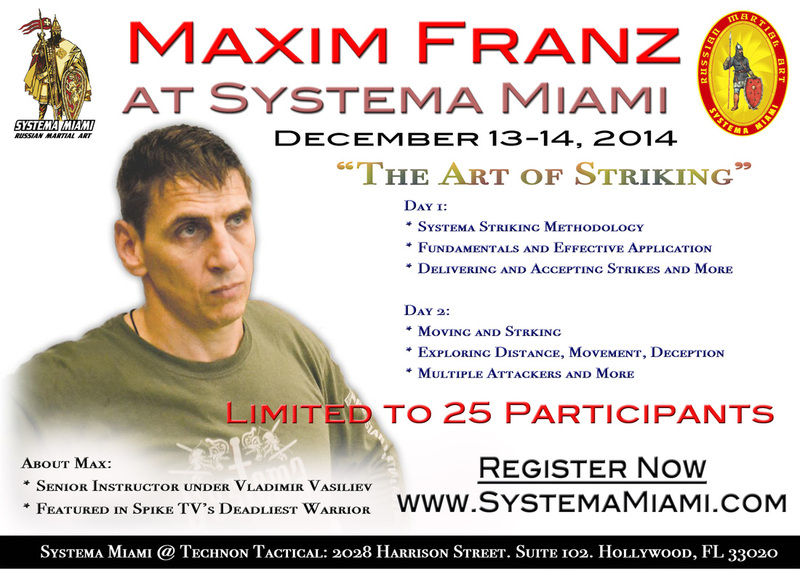 He is Vladimir's number one assistant, certified to teach all aspects of Systema. He has been training with Vladimir Vasiliev since fall 1998. That training means 3-4 times a week regular kind of training besides teaching at least 2 classes a week for the last 8 years. Because of his unique combination of skills and experience, Max is an authority in Systema and all areas of rifle and handgun fighting skills, unarmed combat and field craft. Max is an outstanding instructor, patient and provides a lot of individual attention. He is one of Systema's most sought-after instructors and teaches seminars across the globe. To make this incredible experience as personalized as possible we will limit this event to 25 participants. The first 25 people to register will be the lucky participants for this very special event. Seminar Topic: The Art of Striking. Day 1: Systema striking methodology. Day 2: Moving and striking. Time: 10am to 3pm. Registration: 09:15am. Address: 2028 Harrison Street. Hollywood, FL 33020. We are now in Downtown Hollywood! Airport: The closes airport is Fort Lauderdale International Airport (FLL) - 10 mins. If needed you can fly into Miami International Airport (MIA) - 30 mins. In general terms, there are plenty hotels in the area. Google Map area code 33020 and search for hotels. Training gear for 2 days (training pants, systema t-shirts (we will have Systema Miami shirts available for sale), training shoes, sweatshirt, extra shirts, hydration, snacks, etc).